I recently read an article which said that Felix Mendelssohn was an even greater compositional child prodigy than Mozart, and George Grove, the founding editor of “Grove’s Dictionary of Music and Musicians” has called Mendelssohn’s “Midsummer Night’s Dream” overture, Op. 21 “the greatest marvel of early maturity that the world has ever seen in music.” This work was completed by Mendelssohn on August 6, 1826 when Mendelssohn was 17 years and 6 months old. While it is true Mendelssohn was a remarkable and most gifted compositional child prodigy, producing mature masterpieces in his teen years, it is not quite accurate in my estimation to say he was a greater compositional child prodigy than Mozart, who also produced several mature masterpieces in his teen years. Given the weight, scope, and influence of Mozart’s mature compositional output, it may seem easy to ignore or overlook his early masterpieces, but there are several early works he created which give no hint of his chronological age, and are composed with an assuredness, mastery, and quality which often equal and occasionally surpass works Mozart composed during his mature Vienna years. 1) The three string “Quartet Divertimenti,” K. 136, 137, and 138, composed in Salzburg in 1772, when Mozart was 16 years old have always impressed me as works of exceptionally rare beauty and Classical-style elegance. Whether performed by a string quartet, as they apparently were intended, or by a full string ensemble, which also comes off with beautiful effect, they are remarkable works, which show Mozart in full command of the Classical style, and the depth of the slow movements of these works are especially profound. The autograph manuscripts of these works resemble fair copies with clear handwriting and few corrections, reflecting the perfect and carefree nature of this music, while not being shallow. There is truly no difference between the mastery and maturity of these slow movements especially, and almost anything Mozart wrote during his mature Vienna years. While these three divertimenti are much different than the “Divertimento in E-Flat Major,” K. 563 for string trio Mozart composed in 1788, this music is still beyond mere “light entertainment” Mozart often composed during his Salzburg years as a teenager. 2) The “String Quintet in B-Flat Major, K. 174, composed in 1773 at the age of 17, was a watershed in string ensemble writing for Mozart, especially when compared to the set of six “Viennese” string quartets he completed immediately before this work. This set of six “Viennese” string quartets, drawing at least in part from the influence of Haydn’s Op. 20 set, with fugal finales in the first and the sixth quartet, and the addition of minuets, are a definite advance from Mozart’s earlier six “Milanese” string quartets, which featured three movements in the “Italian” style. Still, Mozart’s finales in these “Viennese” quartets tend to be quite short, and while I myself consider all of them masterpieces except for the second of the set in A major, they are still fairly “lightweight” in content and are still some distance away from the maturity and mastery found in his six string quartets dedicated to his friend and mentor, Joseph Haydn. Nevertheless they are still quite lovely, elegant, and gracefully epitomizing the Classical style. In the “Haydn” quartets, Mozart achieved the pinnacle of his string quartet writing, composed between 1782 and 1785 when Mozart had settled in Vienna, and after he had been exposed to Haydn’s latest and highly influential Op. 33 set of six string quartets of 1781. What is most striking about the “String Quintet in B-Flat Major,” K. 174 is the overall scope of the work in comparison to the “Viennese” quartets. As if literally overnight, Mozart jumped to full maturity in his string writing, with this work lasting nearly twice as long – almost 30 minutes compared to the last of the “Viennese” quartets, K. 173 in D minor, which lasts some 15 minutes with a short 3-minute fugal finale. In the “String Quintet” K. 174, Mozart wrote a long and fully developed sonata-form first movement replete with amazing contrapuntal execution in the development section, followed by a moving and transcendentally beautiful adagio. The minuet has an energy and a vitality beyond that of some of the minuets found in the “Viennese” quartets, and Mozart even composed a very interesting and lovely second trio of this minuet he discarded from the final version. But the crowning jewel of this work which really makes it stand out above all of his string writing to date is the finale. Mozart must have placed great value on this work, trying to make it more and more perfect, as evidenced by the composition of the second trio in the minuet, and even going so far as to compose an entire second finale for it. Both finales last approximately five and a half minutes – almost twice as long as the K. 173 string quartet finale written immediately before this work. Mozart decided on the version which utilizes the main motific eighth-note theme to start the movement, instead of the other discarded version which begins with the running sixteenth-note figure. The two finales reveal an insightful look into Mozart’s compositional process, how he would rework themes and motifs, and rearrange them to achieve what he considered the best version of those combined ideas. It is fascinating in both finales, how Mozart handled the same musical ideas in very different ways in two equally perfect finales. It is one of many testaments to his amazingly ingenious compositional ability. The finales of this quintet are extended rondos which display a staggering contrapuntal mastery and complexity in conception which was unprecedented for Mozart’s string writing at the time, and is at least the equal in skill and execution of any finale Mozart wrote for the “Haydn” quartets several years later, not to mention in his late string quintets of 1787, and 1790-91. 3) “Symphonies No. 25 in G Minor, K. 183, and No. 29 in A Major,” K. 201. 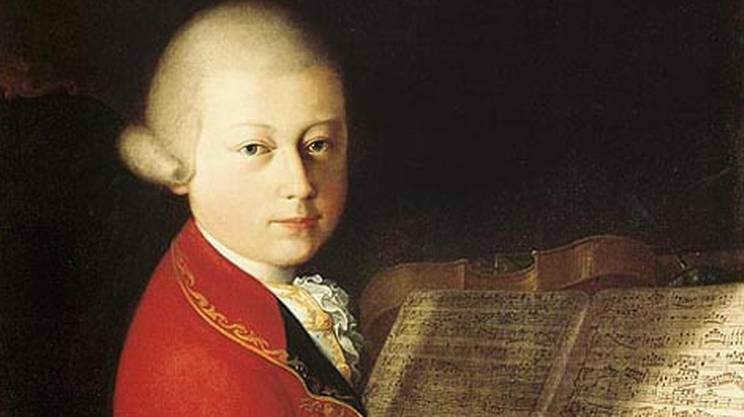 Mozart wrote literally dozens of symphonies in his youth, starting with his first at the age of eight. However, while some are more interesting and convincing than others, none can compare to the maturity and mastery of these two symphonies, epitomizing the elegance, balance, and contrast of the Classical style – one reflecting the dark side, and in the other, the light. Once again, we have a watershed moment in Mozart’s development as a composer at the age of 17 when on October 5, 1773 he completed the “Symphony No. 25 in G Minor,” K. 183, the “little G-minor,” and at the age of 18, in 1774, when he composed the “Symphony No. 29 in A Major,” K. 201. Both are undisputed masterpieces lasting almost a half hour in duration, and featuring four movements which include minuets and trios, brilliant rondo-finales, and a seriousness and maturity in their conception unequalled in all of his symphonies preceding them. 4) The five violin concertos by Mozart, K. 207, 211, 216, 218, and 219 are said to have been composed within a span of just eight months – between April and December of 1775 – an amazing achievement by any composer of any age, let alone a young composer coming into his own at 19 years old while working on other compositions at the same time. While some research has revealed the first of these concertos in B-flat major, K. 207 may have been written as early as 1773 at age 17, it is still remarkable to hear the maturity and progressive growth revealed in these five violin concertos over such a short period of time, even if we assume Mozart composed only numbers 2-5 during that eight month time frame in 1775. While not all of these works may be considered masterpieces by everyone, at least the third, in G Major, K. 216 and the fifth in A Major, K. 219, also known as the “Turkish” for its exotic “Turkish” style in the fast section of the rondo finale, are undisputed masterpieces. The slow movements of all of these works are extremely beautiful arias for violin and orchestra. They demonstrate Mozart’s inexhaustible and ingenious melodic gift, and in these concertos in general, his gift for subtle yet perfect contrasting harmonic and tonal color. It is remarkable in the last movements of the “Violin Concerto No. 5 in A Major,” K. 219, and the “Violin Concerto No. 3 in G Major,” K. 216, how much contrast he achieves with tone color and orchestral texture with such a small orchestra featuring only pairs of oboes and horns, strings, and solo violin, and in the K. 219 “Turkish” concerto, he uses none of the traditional “Turkish” instruments of bass drum, cymbal, piccolo, and triangle to achieve this “Turkish” atmosphere. In both concertos, the last movements feature lots of interesting contrast achieved from the use of pizzicato in the string section, tempo changes, contrasting articulations, and masterful melodic exploitation of the high and low registers of the solo violin. 5) The “Piano Concerto No. 5 in D Major,” K. 175 was also another remarkable advance for Mozart, who wrote his first original piano concerto at the age of 17, in December of 1773. His four previous numbered piano concertos were written as arrangements of works by other composers such as Raupach, Honauer, and Schobert, and his next three unnumbered piano concertos, K. 107 were arrangements of works by Johann Christian Bach, so for all intents and purposes, this is Mozart’s Piano Concerto No. 1. However, his mastery of the concerto form already at the age of 17 shows little signs of a novice learning his way, but a mature composer in full command of the virtuosic and melodic effects he wanted to achieve in the concerto form on the instrument for which he would write the vast majority of his concertos – the pianoforte. What’s more, this work was only the beginning of what was to come in his great Viennese piano concertos he composed for subscription concerts in the 1780s – arguably Mozart’s most impressive body of work. Mozart himself thought highly of it, taking it with him on his tours to Munich in 1774, and to Mannheim and Paris in 1777-1778, and adding a new finale for it, the “Rondo in D Major,” K. 382, in 1782 while preparing it for performance just after arriving in Vienna the year before. This piano concerto is a work I was late to discover in my Mozart studies, having purchased only a couple years ago, a box set of all the piano concertos on period instruments, performed by Malcolm Bilson and the English Baroque Soloists conducted by John Eliot Gardiner. My personal feeling is Mozart should have left the original finale as it was – a brilliant and virtuosic rondo, and not changed it because stylistically, the new rondo does not fit the first two movements, and was likely written to suit Viennese taste at the time. While Mozart said the new rondo was quite enthusiastically received by its first audiences, its content and execution is not as inspired or as masterful as that of the original rondo, and serves as an example of Mozart’s earlier Salzburg work surpassing a work from his mature Vienna years. The original rondo is a perfect finale to an amazing composition. It is easy to underestimate Mozart at any age, because his work sounds so inevitable, so easy, and so perfect, we tend to take it for granted. Even so, it is clear when Mozart wrote music primarily to satisfy his listeners, and when he was truly stepping out into worlds and sounds never before heard, yet still within the elegance and style of the Classical era. Even in his teens, Mozart stepped out and went beyond the conventions of his time far more often than he is usually given credit for. There are other works I could include in this category of early masterpieces, such as the lovely motet, “Exsultate Jubilate,” K. 165, written just shy of Mozart’s 17th birthday, and the “Divertimento in D Major,” K. 131, written in Salzburg during the summer of 1772 when Mozart was 16 years old, in which Mozart displays ingenious writing for four horns and imaginative concertante writing for woodwinds throughout this work, which essentially amounts to an ambitious, six-movement serenade in everything but name. The second movement is an exquisitely beautiful adagio for strings alone, which again is as masterful and moving as almost any slow movement Mozart composed during his mature Vienna years. While it is true much of Mozart’s early music falls into the category of “pleasant light entertainment,” there are many early Mozart masterpieces, some more or less known, which definitely deserve to be heard and appreciated for the mature and beautiful masterpieces they are.